Modern lifestyles are different from the past, as our ancestors worked in environments in which they stood up regularly. Good posture was a byproduct the lives they led. But with the advent of technology, that’s changed. Most people now work in positions damaging to health. Much of the time we don’t realize we’re standing or sitting in the wrong position. Bending over to write, slouching at the computer, and even leaning into a mirror – all affect posture. This is where the Bax-U Posture Brace comes in – a posture corrector designed to protect the back from the ravages of modern living. After having reviewed more than 25 products, it is clear that the Bax-U offers the best-engineered posture support along with the greatest comfort. The Bax-U expertly does what any posture brace should – provide spinal alignment, be comfortable, and meld into the background to help you forget you’re wearing it. The Bax-U is my #1 pick and favorite posture device as of July 2017. Dr. Romina Ghassemi, a specialist chiropractor who owns two clinical practices in Santa Monica and San Pedro, California, invented the brace. She was inspired to make the device after experiencing life with her mother’s debilitating migraines. When she was young, her mother suffered migraines that lasted for days. During that time Ghassemi had to look after her mother and had to live in a house with no light or sound, just in case her mother’s condition worsened. After that, Ghassemi promised herself that she was going to dedicate her life to reducing the suffering of others. Over time she worked her way up from working as a sales clerk in a department store to a Chiropractic Doctor. A string of fortuitous events led to her start her practice where she could develop her products designed to reduce the effects of pain in modern living. Ghassemi describes herself as an “orthodontist of the back.” Whereas Orthodontists work to align people’s teeth, she does the same for backs. But Ghassemi is more than just a physical rehab specialist. She’s also a holistic practitioner. She realizes that the way to treat the body is to treat the whole body, which means treating all lifestyle habits from the way we eat to how we live and work. To Ghassemi, an ounce of prevention is worth a pound of cure. In time, Ghassemi invented the Bax-U posture brace. In a podcast interview, Ghassemi put it like this: “what toothpaste does for your teeth, [the Bax-U] does for your spine – it reduces decay.” As a biomechanical specialist, Ghassemi learned that she needed her patients’ spines remained in the correct posture, not only for an hour or so in her clinic, but for the other 23 hours in the day, living their regular lives. Early in her career, she was selling a lot of medical products designed to treat her patients’ symptoms, but none of them were fundamentally addressing the cause of back pain. Ghassemi realized she could tackle the root of many health problems with posture braces. There were other braces on the market – but there was a problem: compliance was low. People didn’t want to wear ugly back braces all day. If people were going to be motivated to use a posture brace, they needed something that was both comfortable and beautiful. It wasn’t enough for the brace to just support their back if it couldn’t hide well under clothes. The Bax-U is lightweight and thin, it works well under clothes, and uses quality materials. The Bax-U is not your typical medical device. It’s a consumer product, coming in a wide variety of different colors, including black, white and tan. Bax-U buyers get excellent support and service. Not only is there a 90-day money back guarantee, but on the Bax-U website, there is a raft instruction on how to use the Bax-U properly. Let’s get right to it: what posture issues does the Bax-U correct? It turns out that the list of potential issues is rather long. Not only does the Bax-U help with slouching and a hunched back, but it also is perfect for rounded shoulders, neck pain, headaches and forward head syndrome – where the head is out of alignment with the rest of the spine. Spinal alignment is the goal of the Bax-U posture corrector, not just pulling the shoulders back. 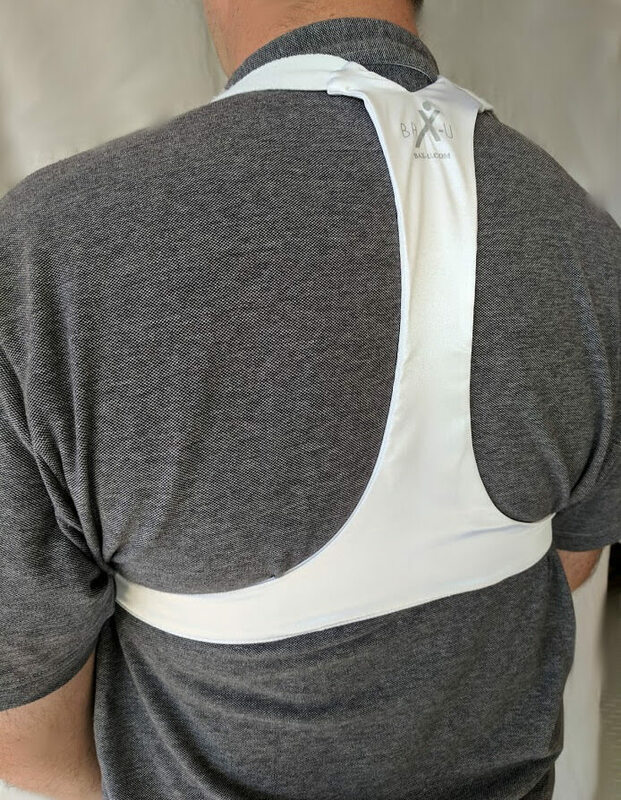 How did the Bax-U unequivocally become my number one posture brace after testing more than 25 different products? It was a combination of factors, including comfort and the excellent and unique posture support I got vs. other products. I ordered the brace in white, and I’m glad I did. White helped to hide the brace under most clothing. Nobody could tell I was wearing a posture brace while at work. I felt more confident and good immediately after putting it on. The Bax-U feels completely different to other braces I’ve tried. It doesn’t just pull back on the shoulders, like most posture correctors – it puts pressure on the lower to middle back to straighten up! The first time I put the brace on, I decided to try it for a relatively short period: two hours. I didn’t tighten the brace to the extreme. Instead, I wore it slightly loose to see how comfortable it was in general. I could do all the things I normally do, like going shopping and driving to work. The Bax-U placed no physical limitations on my body. The next time I put on the Bax-U, I decided to log onto the Bax-U website and check out the instructional video. This video showed me how to put it on precisely, and I decided only to wear it for an hour this time. I tightened the posture brace up tight, putting more pressure on the middle of my back. Immediately I felt the difference. Suddenly, muscles which I wouldn’t ordinarily use sprung into life and started to get quite a workout. No longer was I leaning into my desk to work. Instead, I had perfect posture, sitting upright in a way that felt healthy. After a couple of hours like this, the brace was too tight around the chest. In hindsight, I should have played around more with the settings on both the shoulder and the chest straps. I noticed that if I loosen the chest strap while keeping the shoulder strap setting the same, the brace is more comfortable. Despite the tightness, there was no chafing or rubbing. Some of the braces I have tested chafe under the arms, which is one of the reasons why the Bax-U won my top pick among posture correctors. After multiple tests of braces and smart braces, and after using the Bax-U for several weeks, I can safely say this product is the best for comfort. Other online reviews say how comfortable this product is, and I can certainly agree with these conclusions: this is the most comfortable posture support I have ever used. Not only does the design feel good, but there is no discomfort in the shoulders after long periods of wear, and no chafing under the arms. 2. Correct Spinal Alignment – Unlike Other Braces! The vast majority of posture braces out there work by pulling the shoulders back. But as we discussed earlier, this is not sufficient to produce the healing benefits patients need. Dr. Ghassemi invented a brace that actually resolves spinal alignment issues. The Bax-U design concurs with my physio research which suggests that just pulling the shoulders back is not a good idea. By putting pressure on the middle of your back, the Bax-U helps you to sit up straighter in a way that places no strain on your body. 3. Easy to Use, Easy to Put On! Thanks to the unique design of the Bax-U, the straps do not tighten under the armpit unlike many other posture braces on the market, which helps to avoid chafing under the arms. You can easily put this on and tighten the Bax-U by yourself. The Bax-U is not manufactured in China, unlike most braces, and you’re guaranteed a product of medical grade. Unlike many braces, the product does not contain neoprene rubber; a material which can cause irritation of the skin. With multiple sizes for both men and women you can find a precise fit with the Bax-U. The product is developed to fit all shapes and sizes, but it’s important to choose the right size. Take measuring tape or cord and wrap it around your lowest rib. Make sure that that cord remains level with the ground so that you get the right measurement. If your size is between 22 inches and 26,” then pick x-small. Between 28” and 34” pick small. Between 36” and 42” pick medium. Between 44” and 50” pick large and 52+” pick x-large. There is the possibility you’ll be between sizes. What should you do then? Ghassemi recommends that you choose the nearest lower size if you’re a woman and the nearest higher size if you’re a man. If you want to get the most out of your Bax-U brace, I would recommend wearing it 2 to 4 hours per day. As you get used to it, tighten the shoulder straps over time, wearing it under your clothes. You should begin to notice permanent changes in your posture in just 12 weeks.